1.1 Potato Leafhopper Explosion in Alfalfa!!! CHECK YOUR FIELDS!!! Last week temperatures ranged from near-normal to 4 degrees below normal. Precipitation ranged from a quarter inch to over 4 inches (in Jefferson County). 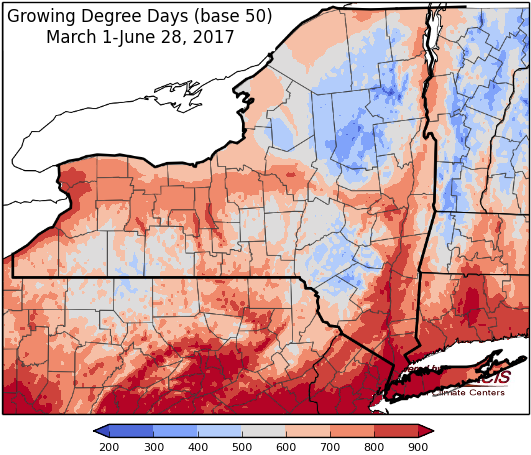 Base 50 growing degree-days ranged from 50 to 160. Today temperatures be in the upper 70’s to mid 80’s. Scattered showers and thunderstorms are possible, especially in northern areas. Some storms could be severe with the threat of heavy rain, damaging winds and hail. Overnight lows will be in the 60’s. Friday will be humid with a chance of showers and thunderstorms. Temperatures will be in the 80’s. Overnight temperatures will be in the mid 60’s to low 70’s. Saturday’s highs will be in the 80’s, again with humid conditions and showers and thunderstorms likely. Overnight temperatures will be in the mid to upper 60’s. Sunday, highs will be in the upper 70’s to low 80’s with a slight chance of showers and thunderstorms. Overnight temperatures will be in the upper 50’s to mid 60’s. Monday’s highs will be in the upper 70’s to mid 80’s. Lows will be in the upper 50’s to mid 60’s. Tuesday will have temperatures in the mid 70’s to low 80’s. Lows will be in the upper 50’s to low 60’s. Wednesday, temperatures will be in the upper 70’s to low 80’s with scattered showers and thunderstorms possible. Lows will be in the low to mid 60’s. 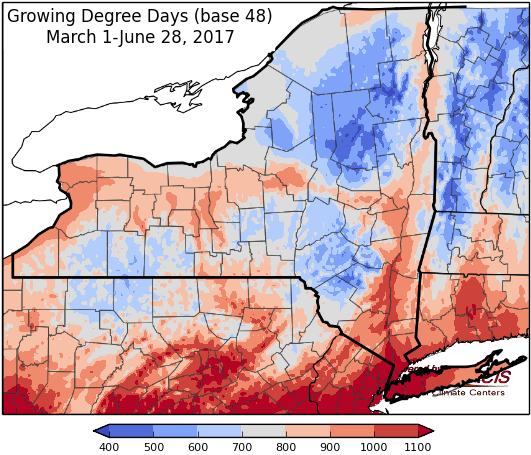 The seven-day precipitation amounts will range from ½” to near 3” . The 8-14 day outlook (July 6-12) favors above-normal temperatures and above-normal precipitation. Reports of hail have come in from various areas of the state, worse in some areas than others. If hail was significant in your area it will be important to get out and look at fields to assess damage. Corn is quite tolerant of defoliation at the growth stages being reported around the state, as long as the growing point was not injured. See attached tables with estimated yield reductions based on percent defoliation and stage of growth. Additionally, find some pictures and field information from a past hail event at around the same point in the year (June 30, 2006) with corresponding yields of the damaged field. In the event that the field does need to be replanted there are still some options. A recent newsletter from Tom Kilcer at Advanced Ag Systems provides timely information on remaining options for forage needs. With any emergency forage the first questions are when can we get it in the ground and what will it yield; however, it is very important to think ahead on how this extra forage will fit into your system. · Who will you feed it to? · How will you store it so it is accessible for feeding the to the intended group of animals? · How much of it will you have, will there be enough tons (acres planted x yield) to incorporate into your feeding programs without drastic disruptions in the animals diet that could lead to other issues? It is good to involve your nutritionist in conversations about what crop options exist and how they could best be utilized. Please contact us or your local CCE specialist with any additional questions. Check your alfalfa fields, especially new seedings for Potato leaf hopper. I have found that many fields are over threshold. Wheat growers… prime time to look at wheat heads in your fields for fusarium. Download this week’s crop report. 3 Be Ready for Potato Leafhopper before the damage occurs! Last week temperatures ranged from near-normal to 6 degrees above normal. Precipitation ranged from half inch to over 4 inches. 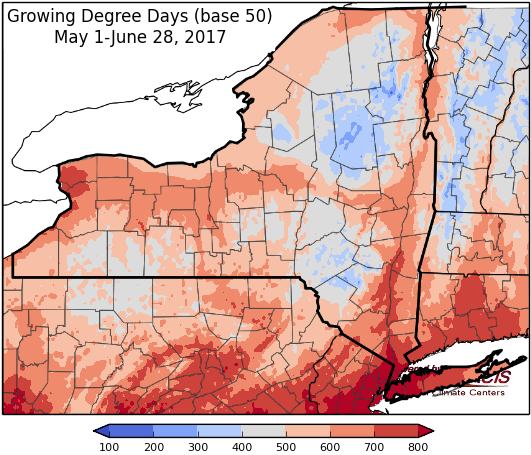 Base 50 growing degree-days ranged from 80 to 160. Today temperatures will range from the mid 70’s to low 80’s. The day will start partly sunny with increasing clouds and a slight chance for afternoon showers and thunderstorms as a warm front moves through. Overnight lows will be in the 60’s to low 70’s. Friday temperatures will be in the 80’s with humid conditions. Rain and thunderstorms are likely, with heavy rainfall possible. Lows will be in the 60’s. Saturday’s highs will be in the mid 70’s to low 80’s with the possibility of afternoon showers and thunderstorms. Overnight temperatures will be in the mid 50’s to low 60’s. Monday’s highs will be in the upper 60’s and throughout the 70’s with scattered showers and thunderstorms. Lows will be in upper 40’s to mid 50’s. Tuesday will have temperatures in the 70’s with scattered showers and thunderstorms. Lows will be in the upper 40’s to mid 50’s. Wednesday, temperatures will be in the 70’s with scattered showers and thunderstorms. Lows will be in the 50’s. The seven-day precipitation amounts will range from ½” to near 2” . Moisture from the remnants of Cindy should stay south of New York. The 8-14 day outlook (June 29-July 5) favors below-normal temperatures and favors above-normal precipitation.